There is a range of European and national regulations that must be considered for operating a show laser system on stage. As a competent specialist, we will guide you safely through the jungle of these regulations. 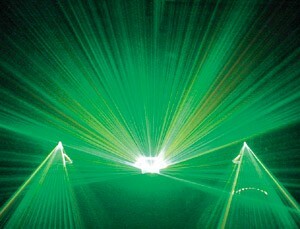 The legislators require that the operator of a show laser system or a stage laser system, or the respective organizer of an event, provides proof that the system complies with the valid regulations, as well as that it complies with the values of maximum permissible irradiation and that no dangers exist for the audience, attendants, operators and actors or performers. These rules about operating a show laser system should not be considered a restriction as regards the performance. Much rather, when applied correctly and with sound consultation, you will ultimately have a laser lighting concept that can be operated safely and risk-free for you and your customers. A few years ago, it was still relatively easy to present an open-air laser show. Nowadays, and in response to some lunatics dazzling various pilots with their laser pointers, strict regulations and approval procedures apply. An open-air laser show represents ‘special use of the air space’. As such, the responsible statutory authorities must be notified accordingly and already at an early stage. Accurate plans regarding the intended direction of the beams (construction of the stage, directions of the beams, timetables, etc.) are required for this purpose. We are also at your service to support you in this case: you can rely on our experience!